Posted January 16th, 2017 by Mike Boyes & filed under Abnormal Psychology, Anxiety OC PTSD, Intervention: Adults-Couples, Intervention: Identifying Key Elements of Change, Psychological Disorders, Psychological Intervention. Description: So have you known any “cat people,” that is people who have a great many cats, or dogs and whose lives are basically overrun by the animals and their failing efforts to manage them all to the extent that they may be evicted from rental accommodation or have the public health authorities (or animal services people) intervene?. Have you thought about why they might be keeping so many animals? Look past any possible tendency to dismiss such people as simply weird and think for a minute about why they might be in the situation they are in with so many cats, or dogs or whatever. Once you have worked out a hypothesis or two have a look through the article linked below. Source: The Human Side of Animal Hoarding: Past Trauma contributes to this mental health disorder, Lisa Esposito, Health, US News.com. So were you surprised to see that animal hoarding fits the criteria for Hoarding Disorder, a diagnostic category in the Diagnostic and Statistical manual (5th edition) (DSM5) of mental disorders maintained by the American psychiatric Association but used also by Psychologists, social workers and anyone needing to find standardized ways to talk about mental illness and related issues? Hoarding involves the obsessive accumulation of objects (or animals) and an inability to get out from under the accumulated mass of objects and related clutter. Sufferers have typically experienced trauma of some sort in their pasts and the incidence of such trauma may be higher among those who hoard animals. Animal hoarders are often very concerned about animals despite the fact that many of theirs may be in ill health or in poor condition. Psychological treatment of the hoarder should be a necessary part of dealing with them and the situations they are found it. By law officer intervention is really only an initial step toward effective intervention. How are hoarding and collecting huge numbers of animals related? What is Hoarding Disorder and how is it related to animal hoarding? 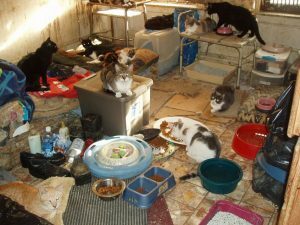 What steps should be taken, given the link between animal hoarding and hoarding disorder when planning to intervene with an individual who is hoarding cats or dogs? Williams, B. (2014). Animal hoarding: devastating, complex, and everyone’s concern: Mental health workers need to be aware of this growing phenomenon, and how collaborating with other services can tackle the problem, says Bronwen Williams. Mental Health Practice, 17(6), 35-39. Patronek, G. J., & Ayers, C. R. (2013). Animal hoarding. The Oxford Handbook of Hoarding and Acquiring, 139.